“When we were making this film and, in general, watching the story of Oleh and Oleksandr, we decided to calculate the distances they ‘traveled’ on the expanses of Russia. 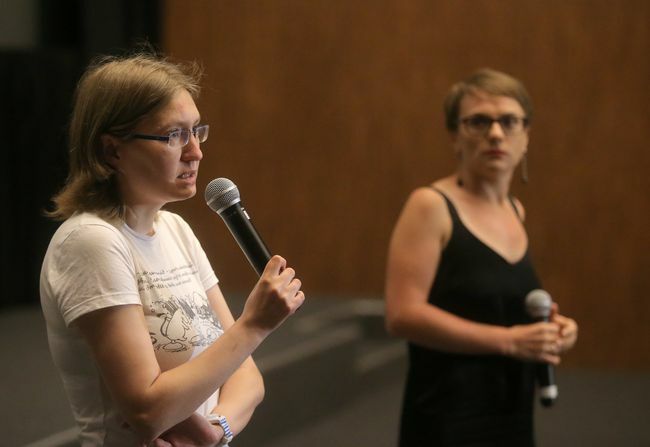 It came to a total 20,000 kilometers for both of them, a half of Earth’s circumference at the equator,” Angelina KARIAKINA, coauthor of the film Across Half the World at Gunpoint: the Story of Sentsov’s and Kolchenko’s Imprisonment, said during the film’s premiere at the Zhovten movie theater. In addition to Angelina, Natalia Humeniuk, Anna Tsyhyma, and Natalia Kaplan, Oleh Sentsov’s first cousin, worked on the film, which is a Hromadske TV (Community Television) project. Oleh and Sashko were arrested in Crimea in May 2014. They were tortured and then taken to Moscow’s Lefortovo pretrial jail. Then there were trials in Rostov-on-Don and conviction for terrorism – 20 years in a high security prison camp for Oleh and 10 years for Sashko. They were transported to their destinations. Sashko is serving his sentence in the Kopeysk prison camp near Chelyabinsk – not exactly a health resort. Besides, inmates had been cruelly brutalized in this camp until recently. They even staged a peaceful protest in 2012, after which the prison administration was changed and the regime was eased. Oleh was first deported to Yakutia and then it was decided to isolate him still more tightly. Since the fall of 2017, Sentsov has been serving his term at the “Polar Bear” prison camp in Labytnangi, Yamalo-Nenets Autonomous District of Russia. Oleh drew attention to himself and the rest of “the Kremlin’s captives” when he went on a hunger strike on May 14. He demands that all the Ukrainian political prisoners in Russia and Crimea (there are 70 of them, according to human rights activists) be freed. Kolchenko also went on a hunger strike on May 31 but discontinued it recently due to poor health. Both Kolchenko and Sentsov have non-public lawyers who bring and take letters, tackle certain procedural problems. “The cases of Ukrainian political prisoners may cost these people a career, so they are trying to do this without too much publicity,” Angelina explains. Besides, the public regularly receives information about Kolchenko from human rights activists Tatiana and Nikolai Shchur. Earlier, when they were part of the Civic Supervisory Commission, they could even see Sashko. But the Shchurs were expelled from this commission in 2016, and they have to work through a lawyer now. A lot of the powers-that-be, including Foreign Minister Pavlo Klimkin; Vadym Chernysh, Minister for Temporarily Occupied Territories and Domestically Displaced Persons; and Hugue Mingarelli, Head of the EU Delegation to Ukraine, came to see the film. “It is very difficult to free Sentsov. But why only Oleh? I am always saying we should not decide on who is more important. Oleh is a unique personality. Whenever I address any audiences, I just quote a fragment from this letter – why he went on a hunger strike. When everybody hears that, in reality, he is starving not for himself but for the release of all the political prisoners and hostages, this creates an altogether different impression,” the foreign minister added. Liudmyla Denysova, the Verkhovna Rada Human Rights Ombudsperson, told journalists recently that she is planning to visit Ukrainian political prisoners in Russia and Crimea – first of all, Oleh Sentsov, Oleksandr Kolchenko, Stanislav Klykh, Mykola Karpiuk, Roman Sushchenko, and Resul Veliliaiev. Petro Vyhivskyi, the father of Valentyn Vyhivskyi who was absurdly sentenced in Russia to 11 years in prison for espionage, liked the film Across Half the World at Gunpoint. He believes such films should be made about all “the Kremlin’s captives.” “The whole world knows about Sentsov and Kolchenko, but there are almost 70 more people about whom very few know. And their relatives cannot fight for them because they have no access to either the media or our governmental bodies,” Petro explains. Asked if he feels any progress in the question of political prisoners’ release, for there have been several international meetings on this matter since Sentsov went on a hunger strike, Vyhivskyi says: “I will feel it when my son is at home.” In conclusion, Petro called on Ukrainians not to go the FIFA World Cup in Russia. One of the most dramatic moments in the film is when Natalia Kaplan is standing behind the fence near the prison camp in Labytnangi. Sentsov’s cousin muses that it is impossible to pull him from captivity, although he is just a few hundred meters away. And it does not matter what distance separates them – 10,000 kilometers or these meters. “This makes it clear what captivity, especially undeserved one, really is,” Kariakina says.